These Nutella-Stuffed Chocolate Chip Cookies made from scratch are the ultimate chocolate chip cookie experience! 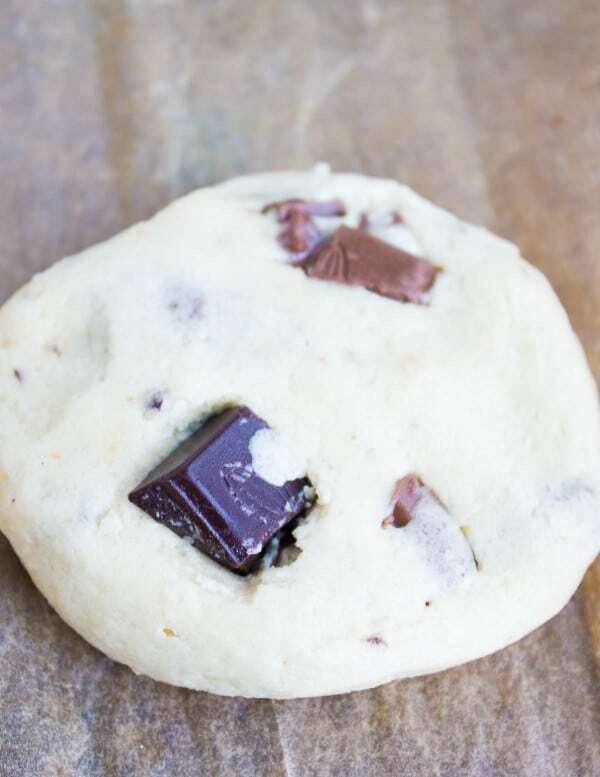 They are buttery, chocolatey, perfectly chewy an so easy to make! A hit with kids and adults alike! This Nutella-Stuffed Chocolate Chip Cookies recipe is a must-try for chocolate chip cookie lovers! Chocolate Chip Cookies made from scratch with melting Nutella stuffed in the center! 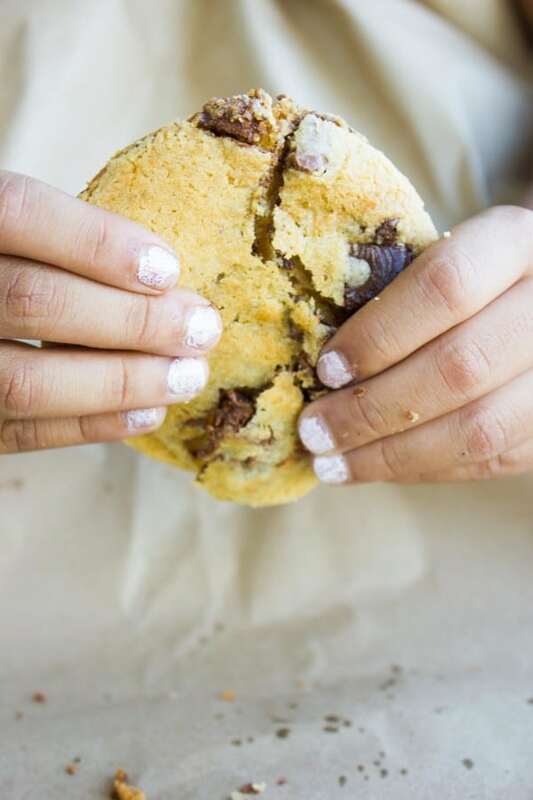 This is the ultimate chocolate chip cookie experience! Stuffing the chocolate chip cookies with Nutella before baking is a tiny extra step that makes every moment worth it once you take a bite! 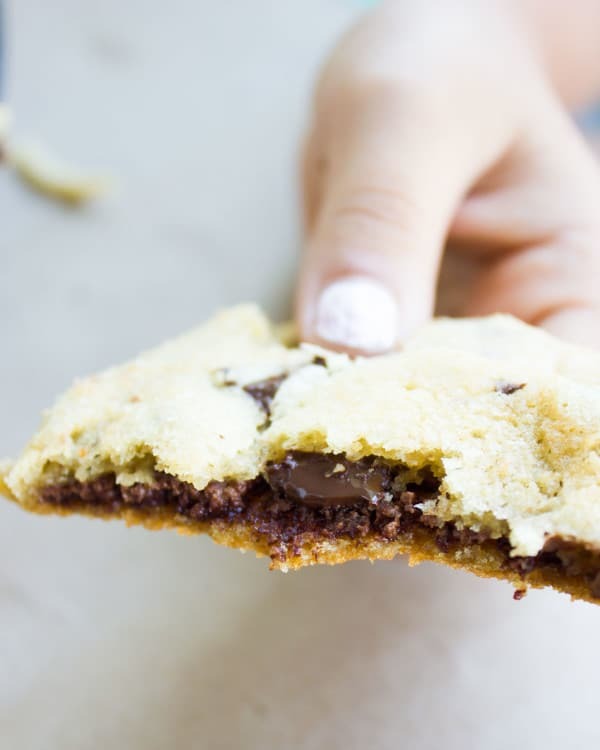 Today’s recipe for Nutella-Stuffed Chocolate Chip Cookies is super fabulous! They’re super chewy, super chocolatey, buttery chocolate chip cookies made from scratch. 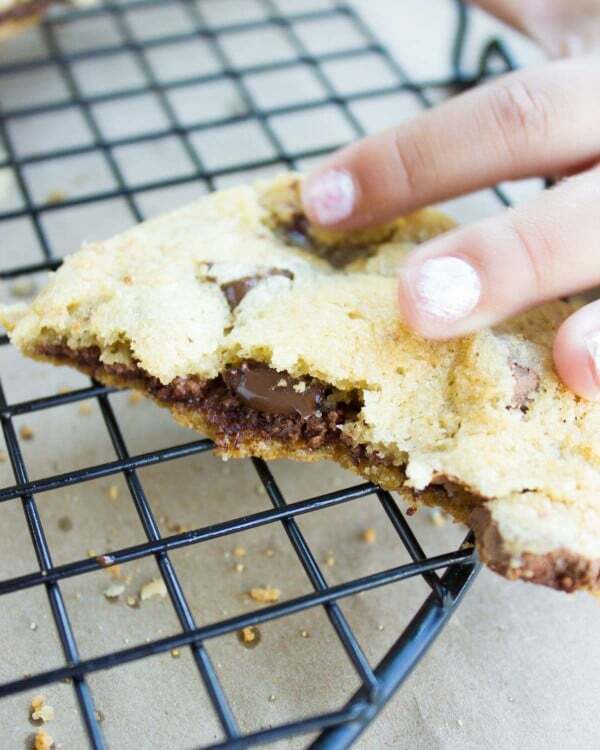 These Nutella-Stuffed Cookies are more of a special treat than just a good old chocolate chip cookie. The Nutella filling in these Chocolate Chip Cookies isn’t overpowering (unless you want it to be and overstuff the cookie). 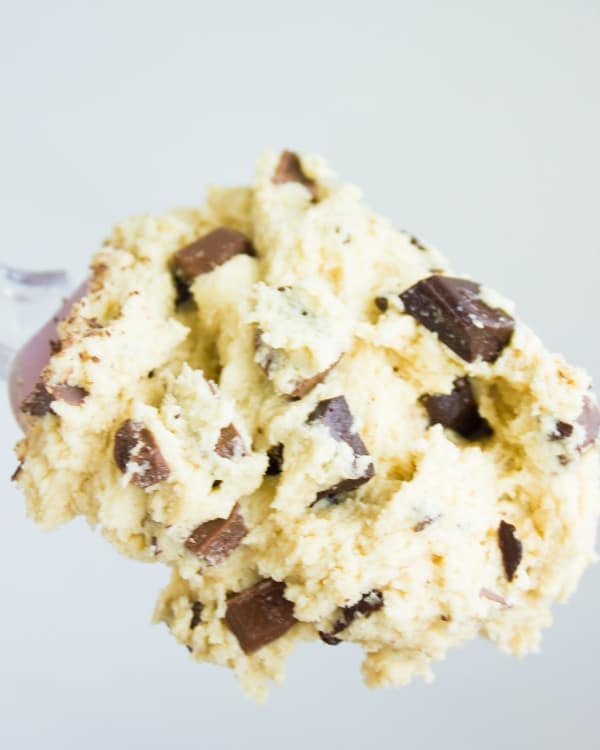 It adds that extra melting sweet chocolate feel, and the cookie dough has the perfect homestyle feel—so it’s not too puffy, nor too flat and it’s very very chewy. 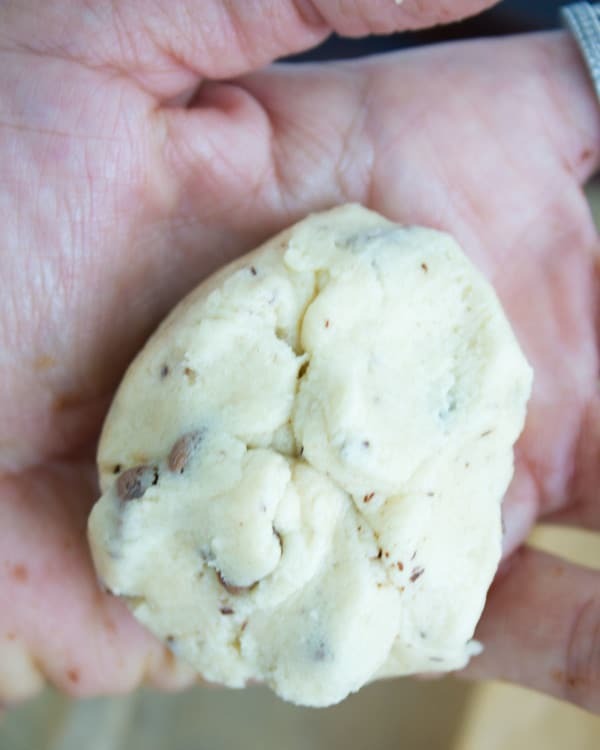 The chocolate chip cookie dough is a breeze to make, you’ll need to beat the softened butter with sugars with an electric mixer for about 3 minutes, add an egg and then quickly beat in the flour, baking soda and baking powder. The chocolate chips (I use chocolate chunks from a chocolate bar) go right in and get folded in with a spatula. I love using a mix of dark and milk chocolate bits here, this adds a unique feel to the cookie when every bite is chocolate-y in a different way. And by adding Nutella to the center of these homemade chocolate chip cookies, the chocolate experience is elevated to a whole other level! 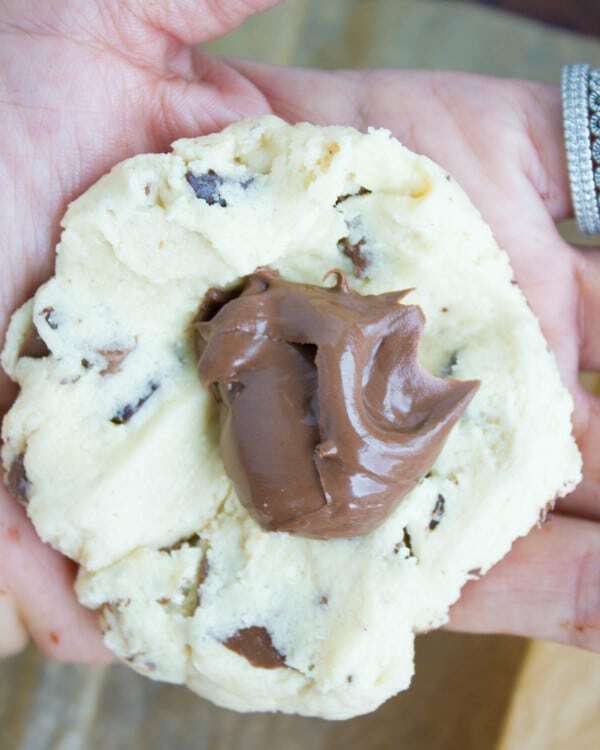 Once the chocolate chip cookie dough is ready, you can take a tablespoon of it, and flatten the dough on the palm of your hand, then take a teaspoon of Nutella (more or less—no judging again) and place it in the center, then fold the cookie dough over the Nutella and roll it gently with both your hands. At this point, you can flatten the Chocolate Chip Cookie a bit and they’re ready for chilling or baking. Baking these Nutella-Stuffed Chocolate Chip Cookies right away will make them a little flatter than if the dough was chilled for an hour prior to baking. 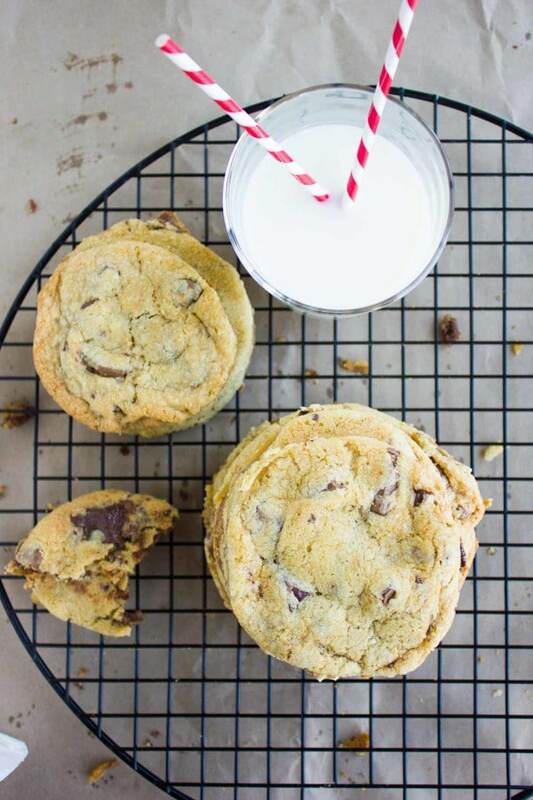 Ok chocolate chip cookie lovers, meet your match—the Nutella-Stuffed Chocolate Chip Cookies are going to blow your mind! Try them once, and never go back! 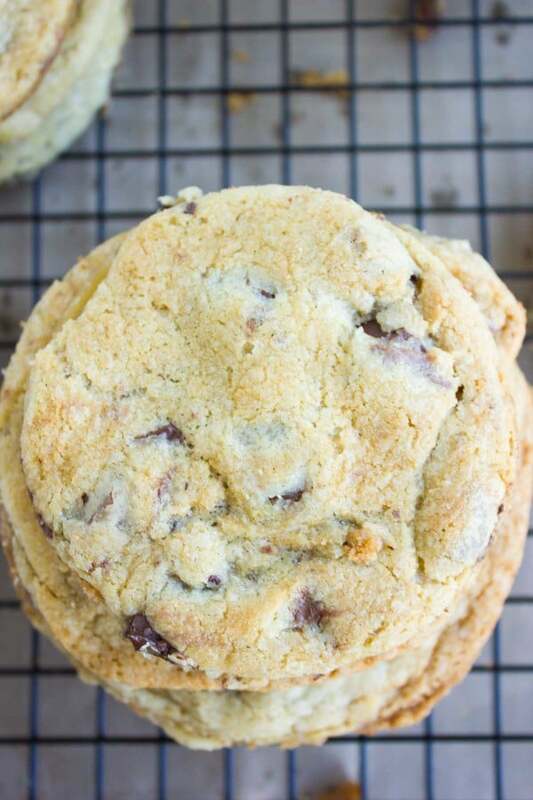 These Nutella-Stuffed Chocolate Chip Cookies aren’t your light healthy cookies, they won’t really help you diet, but they might also be the best chocolate chip cookie recipe ever! Just one of these homemade Chocolate Chips Cookies is enough to take you to a happy place, so don’t miss out on them! Please! We made these Nutella-Stuffed Cookies last weekend, we had unexpected gorgeous weather and the girls had a playdate at the park. As they were getting impatient to leave, I thought I’ll get them busy and make chocolate chip cookies made from scratch to take with us to the park. All the tiny hands got messy making these Nutella-Stuffed Cookies, eating them, photographing them and sharing them with friends at the park..actually, even the seagulls at the park had their share of those Nutella-stuffed Chocolate Chip Cookies! Who knew they loved chocolate this much! 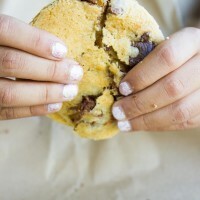 As you can see my tiny helping hands are anything but helpful when it comes to taking photos of their favorite Nutella-Stuffed Chocolate Chip Cookies! 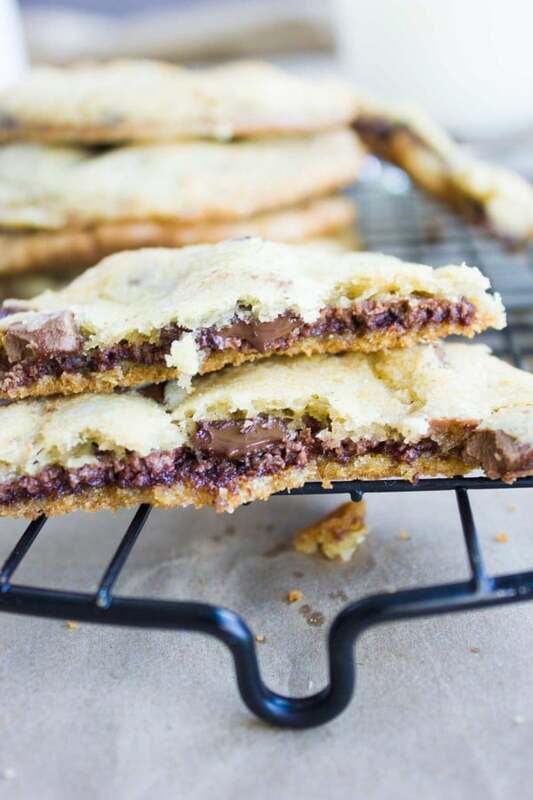 Fill these Nutella-Stuffed Cookies with as little or as much Nutella as you like. Feel free to use any other chocolate spread or cookie butter to fill these chocolate chip cookies. Preheat the oven to 350 degrees F. Prepare a parchment lined baking sheet. In a small bowl, whisk the flour, baking powder, baking soda and pinch of salt. In a bowl, using an electric mixer, beat the butter and sugars for 3 minutes until the mixture is light and fluffy. Add the egg and vanilla and beat them with the sugars until just blended. Then add in the flour mixture and mix it in with the mixer for another minute. Using a spatula fold in the chocolate chunks. Take golf size balls of dough (bigger or smaller according to your preference) and flatten it on the palm of your hand, place a teaspoon of Nutella in the center and fold the dough over it rolling it back gently into a ball. Flatten the ball slightly into a cookie shape and place on the cookie sheet. Chill the baking sheet as is, covered with plastic wrap for about an hour and then uncover and bake the cookies for 12-14 minutes (depending on the size). Alternatively, you can bake the cookies right away. Or you can freeze the cookie dough shaped as is and baked straight from freezer for an extra 2 minutes. Thank you Mahy for all of ur amazing recipes. Thank you my dear Miss “W”!! I knew you this would grab your attention 😉 Enjoy them! Hi Ava, this batch makes 10 cookies (2 inch diameter size). Hope you make them soon! What is not to love in this cookie? Chunks of chocolate and nutella is a dessert lovers dream. I personally love using chocolate chunks as well instead of chocolate chips. That is a good mouthful of chocolate goodness. The sinful cookie at its best. So trying this with the kids over the weekend. These look like the perfect crispy on the outside soft and chewy in the middle cookies. I would love to break one of these in half and see all that delicious nutella! The chocolate chip cookies to die for! What a great way to make these yummies! They will definitely be a hit in my house!